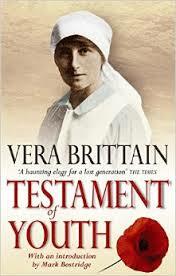 One of my favourite books is Vera Brittain’s Testament of Youth, which I’ve read at least five times. I’ve read all of Brittain’s novels, diaries and letters available, as well as those of her friend Winifred Holtby, and other contemporaries who appeal to me. In fact, because I find it so interesting, I make a point of not including this as something I work on; this isn’t a ‘research interest’; it’s just an interest. There is something in the way Brittain writes which speaks to me; I think it probably has a lot to do with her descriptions in the book about her education, as a bookish girl who was desperate to go to university, which struck a chord with me when I was sixteen and first read it. Her response to the events she experiences during the First World War – the death of young men close to her, the blighting of her own opportunities (in the short term, at least), the physical struggles of nursing wounded soldiers – are described clear-sightedly, and her growing political convictions (pacifism, feminism) have evident experiential roots. The myth of the ‘golden age’ of Edwardian life before the war is one which has been repeatedly proved untrue; for many in Britain, 1913 wasn’t much easier than 1914. But for some, particularly idealistic, middle-class women such as Brittain, it’s easy to see that the shattering of ideals by war did make the period before seem like a never-to-be-recovered time of innocence. Brittain is clear that this golden glow was imparted as much by ignorance as innocence, though, and the book is careful not to romanticise anything, though it has become (mistakenly, in my view) seen as a kind of romantic classic of war due to Brittain’s engagement to Roland Leighton. That’s the book, then – and if you haven’t read it, then do, while we are in the centenary period of the Great War; Brittain wrote to show the devastating effect of war on young people and the way in which it blighted the lives of a generation, and her work has much wider implications for politics and is worth considering even if you’re not interested in the period. 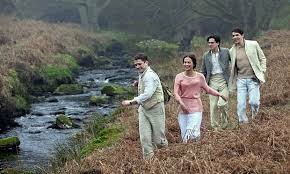 As you can imagine, then, I approached the film with some trepidation. I’m probably too much of a purist and am almost always disappointed with films of books, perhaps because I don’t know enough about cinema, adaptation etc to understand why they have to change my favourite bits, etc… And some of this is changed for dramatic effect too, including some seminal scenes (I don’t want to give away any spoilers so I won’t say more!) 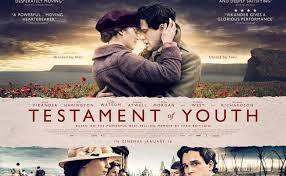 The review by the Guardian criticises the film for drifting into ‘heritage inertia’, avoiding the ‘necessary’ pain and anger, but I don’t think this is fair; the film unavo idably has a ‘period drama’ look about it (to change that would undermine the essential historicity of the narrative) and, of course, it will have an appeal to lovers of period drama and heritage cinema. But the restraint for which the review criticises the film is also present in the book; Brittain is determined to change things, to make the world a better place, by writing a book which explains how she feels, and being excessively emotional is not how that works. In the film, we see her cry, anguished, several times, we see her frustration and anger, and while it isn’t excessive, the restraint rings true, and all the more because earlier in the film we see her restrained happiness, too. Excessive display of emotion is what women were criticised for, and Brittain, well aware of that, reined hers in, publicly at least, and Alice Vikander’s (and others) beautifully restrained performance reflects that mood. The film is one of those where everyone watching it will know that the eventual fate of the happy teenagers we see at the beginning will not be so cheerful, and therefore there is a hubristic feeling hanging over the characters from the beginning, again a trope shared with the book. I suppose my conclusion is that the film, while not strictly true to every detail of the (long) book, is true to its mood and its convictions, and of that I approve. 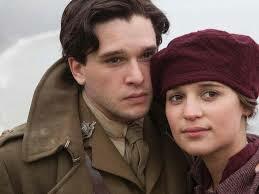 Though I must admit I did spend quite a bit of the film wondering about knitting a new beret (see picture above).